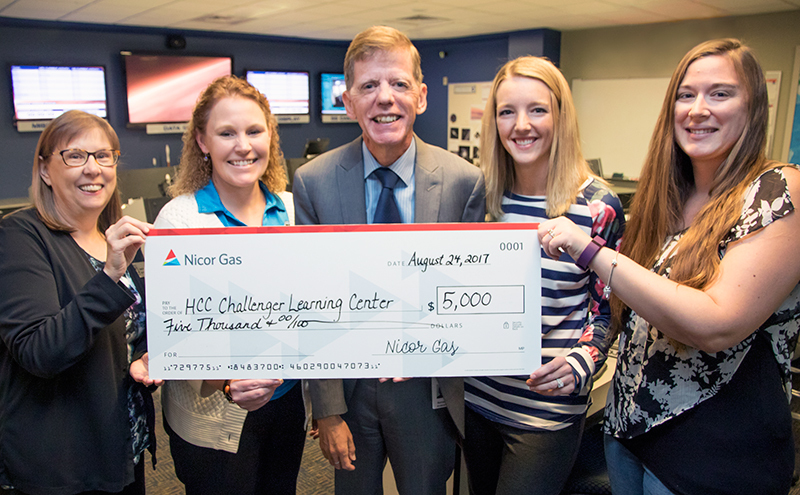 Thanks to a recent $5,000 donation from Nicor Gas, the Challenger Learning Center (CLC) at Heartland Community College will add robotics to its educational experiences. The donation signifies a commitment between Nicor Gas and the CLC. The mission of the Challenger Learning Center is to engage learners with hands-on activities in STEAM (science, technology, engineering, art and math). One of the main activities is a simulated flight to space where students work in teams to communicate effectively and solve problems. Throughout the activity, students conduct experiments, monitor the crew’s health and build a probe to launch into space. Overall, activities at the CLC purposefully mimic the work of STEAM professionals, such as scientists and astronauts, in an effort to inspire students to pursue a career in a STEAM field. Bernie Anderson, manager of community relations and economic development at Nicor Gas, hopes that if students decide to pursue a STEAM career, his company would be a top choice. According to him, Nicor Gas has several similarities to NASA. In addition to lessons on coding, the donation offers the CLC an opportunity to mimic what Nicor Gas does. Although the program is still under development, it does have a name, Challenger STEAM on the Road: Drilling for Resources on Earth and Mars. Evens hopes to purchase the robots by the end of September and test the program by December. The goal is to offer it more widely in January. Learn more about the Challenger Learning Center.